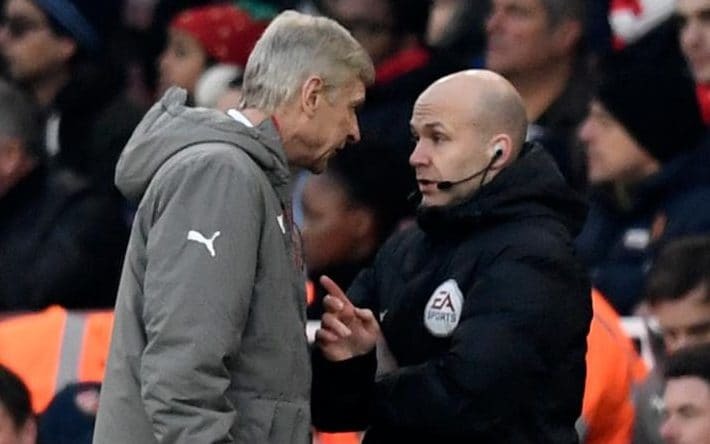 Arsenal Manager ,arsène Wenger has escaped a stadium ban for pushing fourth official Anthony Taylor, but will not be on the touchline for Arsenal’s vital clash against Premier League leaders Chelsea next Saturday. four-match touchline ban, the first of which will be served in Saturday’s FA Cup tie against Southampton, and a £25,000 fine after being charged with misconduct and improper conduct by the Football Association. An Independent Regulatory Commission served the punishment on Friday after Wenger admitted the charge and requested a personal hearing. Wenger denied calling referee Jon Moss a cheat for the award ofBurnley’s penalty in Arsenal’s 2-1 win, but the Frenchman clearly shoved Taylor after being sent from the touchline and remaining in the tunnel area. There were suggestions that Wenger could be forced to serve a stadium ban for his actions, but he will instead be forced to sit the stands for the games against Southampton, Watford, Chelsea and Hull City. It is the game against Chelsea that will cause Wenger most concern with Arsenal’s continuing Premier League title hopes potentially resting on that game.